It's my turn over at the Country View Craft Project Blog and I am finishing the month continuing the blues and greens challenge theme with another technique and journal panel. But I wanted to grunge it up some more for my journal so I edged all four sides with raw umber blending it over with a blending tool and foam then I mixed a dirty wash of quinacridone gold and paynes grey and painted that round the edges. 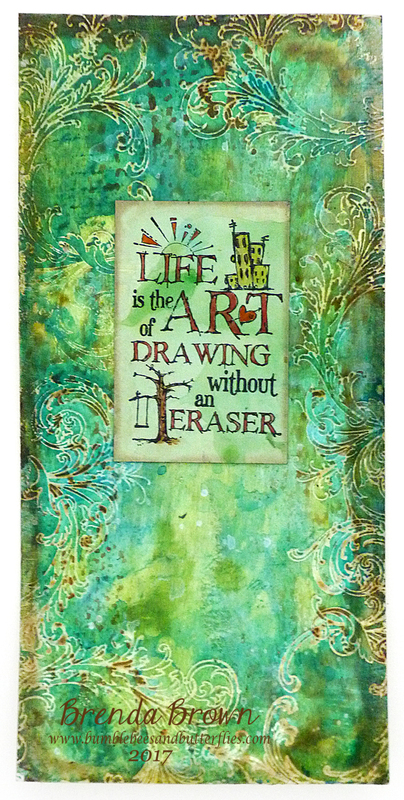 I had used some card to mop up some of the paints as I had been using them and I stamped the old Tim Holtz quote on some, coloured in the letters with some Pitt artist pens and edged it with ground espresso distress ink before adhering it to the panel. I love how you've worked this resist panel. It looks so awesome. This technique and design idea has like an endless array of possiblity for a finished piece. Love it! I love everything about this page, Brenda--the colors, the quote--all looks fantastic! This technique works so well both ways, but I do love the finished article. Brenda this is gorgeous!! I was over to check it out, and I am so happy that you shared your steps for us!! Stunning colors and choice of embossing!! Brenda, this is stunning, and I'm so going to give it a try! I just passed up that stamp, and now I must go sit in the "aren't you sorry now" chair! Love the touch of grunge, making for an outstanding journal page! Hugs! Love the gentle version and the grunged up version - so cool to give that fabulous sentiment stamp centre stage too. BOth versions are gorgeous - adore those tones of blue and green . Fabulous stenciling and wonderful quote- the first TH stamp set I bought .